In both cases, a startling imperative headline sits above a straight, completely unexceptionable news story. And although the big type appears to come straight from the pulpit, what follows below makes clear that these are – of course! – just third-party opinions: the words of a “former immigration chief” in the first case and a now-former prime minister in the second. The attribution has unaccountably gone missing from the headline, but it’s right there in the standfirst. It’s just that, in a respectable publication, one might reasonably hope to find attribution in the headline as well. Perhaps you might not want to waste a line on “…PM urges” or “says expert”, but you could always, for instance, put the entire headline in quotes? Some newspapers don’t like to have quotation marks in headlines. 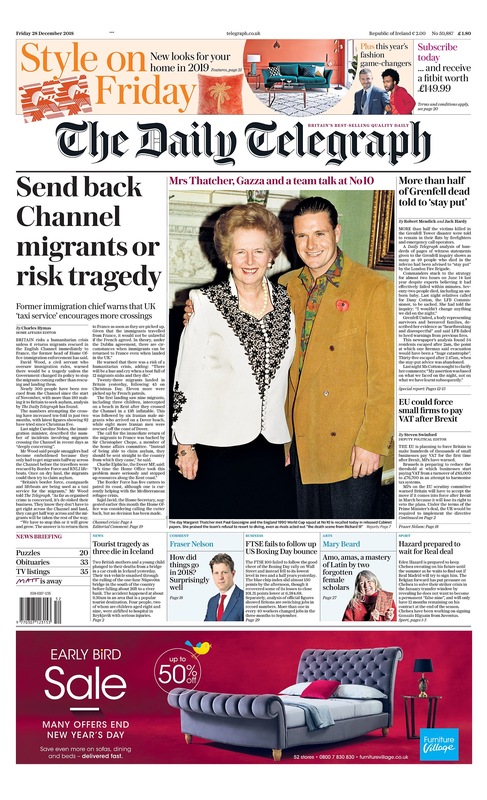 But the Telegraph isn’t notably one of them, and there are some in the story right next to the migration splash. Did the quote marks get left off by mistake? But this has happened twice now, and both times on supposedly nation-in-crisis subjects that resonate strongly with Telegraph readers. It only happens for a moment: then the mask of impartiality is replaced in the standfirst. But the shock of having glimpsed the real face of the newspaper, or seen the limits of journalists’ patience with the niceties of their trade, lingers. This is particularly so in the case of the general election: on the same day as that front page appeared, the newspaper emailed every one of its subscribers openly urging them to vote Conservative. 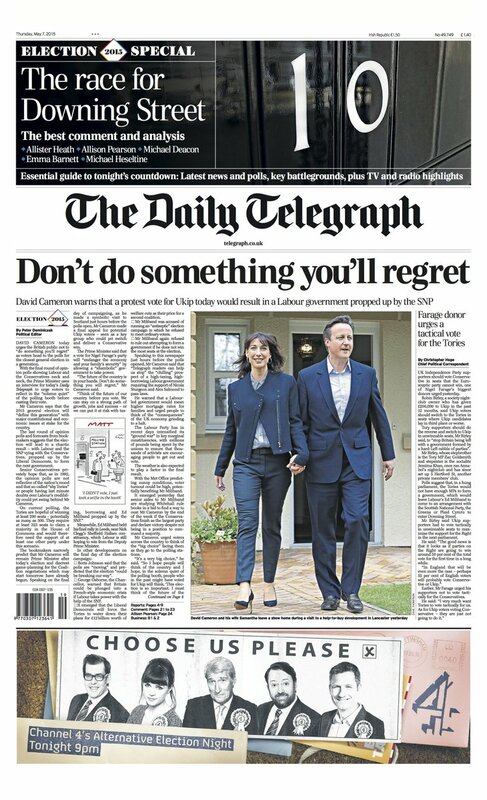 It’s not that the Telegraph has contrived to put a pundit they agree with on the front page: many papers do that. It’s that they appear to have allowed him to write the headline as well. And yes, not everybody likes claim quotes: but strange things start happening when they disappear. While Ten Minutes Past Deadline is on its short break, your attention is drawn to this fantastic discovery from Fred at HeadsUp – a US newspaper manual from the 1940s that lays down chapter and verse on the use of the flying verb (sorry, “implied subject”), including warning about the risks of their being misread as imperatives, and even has advice to offer about claim quotes. Says well worth a close read. Well, never mind the Paris Accords – thank goodness this has been settled, years in advance. A decisive example of international cooperation. Wait, hang on, what’s this? We have seen so many examples of claim quotes being used where they shouldn’t be – around claims that only the reporter has made, or around naked editorialising in the display type – that it’s quite a shock to see a headline not have them when it needs them. 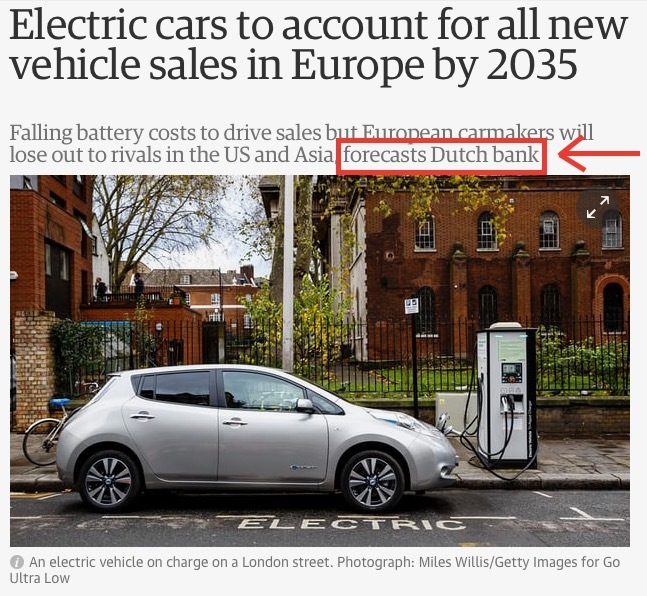 This Guardian story is not about a fact, it’s about a claim; not about a decision but a prediction. So the headline cannot stand like this, without any attribution at all. Yes, the source of the assertion eventually appears in the standfirst, but that’s too late: a headline containing a claim must signal the existence of that claim within itself. * This is a highly sensitised part of British newspaper culture: there is a huge difference, to UK readers, between QUEEN AND PRINCE PHILIP TO DIVORCE and QUEEN AND PRINCE PHILIP ‘TO DIVORCE’. The former is a categorical assurance, a truth on which the newspaper is staking its reputation. The latter is clearly nothing of the kind: a secondhand claim at best, and one from which the newspaper is distancing itself by punctuation. It puts one in mind of the hoary “that’s what …” construction beloved of US beat reporters and long studied by Fred at HeadsUp, in which a striking, apparently declarative opening sentence is only fully contextualised in the succeeding paragraph. There’s no way a man could have blown up an airliner using explosives hidden in his briefs. That’s what defense attorney Anthony Chambers is claiming in his latest court filing involving Umar Farouk Abdulmutallab, the Nigerian national charged with trying to blow up a Detroit-bound airliner with a homemade bomb in his underwear on Dec. 25, 2009. Monica Conyers doesn’t have a good enough reason to take back her guilty plea and her sudden claim of innocence doesn’t cut it. That’s what the federal government argued in court documents filed Monday with the U.S. 6th Circuit Court of Appeals, where Conyers is fighting to have her guilty plea withdrawn. Which in turn raises a wider question about how long a newspaper should be allowed to keep its readers on the hook before revealing the contested or partial nature of what it’s saying. I would suggest – whether we’re talking about a headline or an opening paragraph – not very long at all. *Especially because, on many news websites, it is only the headline, without the standfirst, that appears on the homepage. This is a somebody-said-something story. It’s on the record, from a person of substance, and unquestionably attention-grabbing; but it comes without any supporting evidence. It is, to use the laconic phrase heard on the Tribune newsdesk, “interesting if true”. So the display type will not announce CLARK KENT IS SUPERMAN in the newspaper’s own voice: it will attribute the claim to the person who said it, and leave readers to judge for themselves. The congressman did not actually utter the phrase “Superman is Daily Planet journalist”, of course, in crisp headlinese. He said: “His name is Clark Kent, and he writes for the Daily Planet.” But this is reported speech, not direct speech, and the paraphrasing of reported speech is uncontroversial, as long as it accurately reflects the sense of what was said. How, then, can you tell a claim quote from an actual quote? In British headline culture, the most significant clue is the presence of quote marks but the absence of attribution. Type B headlines, of course, do not need quote marks at all, and even in the UK, readers would be disappointed to see a Type A headline – quote marks and an attribution together – if the quotation was not verbatim from the source. Quotes are the lifeblood of journalism in the UK as they are everywhere else – the Scotland football manager Gordon Strachan once sourly observed that he saw media interviews as a reductive game in which journalists would try to get him to use a certain word: if he avoided saying that word, he won; if it slipped out, he lost. Accordingly, the presence of a direct quote and an attribution together in a headline is usually an indicator of a journalistic “victory” of this type, where the story is that a public figure has used a newsworthy turn of phrase. However, to British readers, an unattributed quote does not primarily indicate the presence of speech, but the presence of a claim. If the quote happens to be verbatim, then so much the better; but either way its significance is the same. The likeliest purpose of an unattributed quote in a headline is to signal the newspaper’s reservations about its veracity. The presumption is that unattributed quotes in Fleet Street headlines rarely indicate speech; they almost always indicate doubt. * This is the key measure of viability, but not the only one; HeadsUp has been collecting a number of claim-quote heds that scrape through this test but fail on wider grounds of comprehension or readability. Claim quotes may be widespread in British journalism, but they’re not exempted from the normal rules of syntax. Years ago – and this is pre-YouTube, so I’ve been searching in vain for clips – there used to be a segment of a British satirical news quiz that revolved entirely around putting claim quotes in headlines. I have a distinct memory of Dara O Briain being in charge, so perhaps it was a round on Mock The Week. Anyway, what would happen is that utterly scandalous, defamatory headlines about eminent people would flash up onto the screen, and the contestants would have to insert claim quotes around the most damaging parts to avoid their imaginary newspaper being sued for libel. The more of the headline you could let stand outside the quotes, the more points you got: those who played it safe and put the entire thing in quotation marks were greeted with jeers and cries of “Cowards!” from the chair. The fact that this idea could ever form part of a national light entertainment programme says a lot about how well understood claim quotes are in the British public imagination. But it also reveals something slightly more worrying: a perception that claim quotes are not just a way to signal a newspaper’s distance from allegations, but a magic device that can be deployed to bamboozle lawyers, avoid editorial responsibility, or quarantine any phrase you’re not quite sure of. The saga of the young people who paid thousands to attend a de luxe event in the Bahamas only to find themselves trapped in ramshackle tents and fed packed lunches has been all the rage on social media, so it’s not surprising the Telegraph has been looking into it. This is their headline, containing not one but two quoted elements, on their main news story last week. The second quoted element, “mugged, stranded and hungry”, is a classic claim quote – which is to say, not an actual quote, but an allegation in reported speech placed within quotation marks to signal its contested nature. This is the headline convention that British TV audiences are familiar with: the shorthand that stands in for a full attribution, such as “claim customers” or “say unhappy youngsters”, that will be made clear in the text. As you read the story, you do indeed find third parties complaining of all three of those things, although the case for hunger is perhaps more understood than explicit. The first quoted element, however, is a different matter. You can look up and down the story, and not see a single reference to either the Hunger Games or Rich Kids of Instagram. And to be clear, I don’t just mean that nobody says it verbatim: I mean that nobody says it at all – not in the embedded tweets, not in the quotes, not in the reporter’s own words. What appears to have happened is that the back bench has perceived the resemblance between the news and two evergreen memes – one relating to teenage excess, the other to teenage suffering – and boiled the story down to one pithy phrase in the headline. But if so, why is it in quotes? You can certainly quibble with this characterisation. Yes, the victims are (probably) rich kids who (probably) use Instagram, but Rich Kids of Instagram (#RKOI), as originally conceived, is something more specific: an ostentatious photography series published by heirs of wealthy families showing themselves driving Ferraris, flying on Learjets or emptying bottles of Krug over their waterproof Rolexes. Many of the Instagram influencers who were reportedly paid to publicise this festival are a different breed: semi-celebrities or actual celebrities with large personal followings rather than unknown trust-fund babies. Similarly, you may not feel that an amusing photo of a cheese sandwich justifies a comparison with the Hunger Games novels, in which teenagers are forced to fight to the death for food in a post-apocalyptic tournament. It’s a judgment call: you might decide that the popularity and social implications of the story justify a little hyperbole. But the point is: quote marks aren’t going to help. This isn’t a claim, or even a report of a claim: it’s a commentary. Newspapers are fully at liberty to editorialise in headlines, of course, but they have to do it in their own voice. If you feel the characterisation is witty and apposite, take the quote marks off. If you feel you’re pushing it by making the comparison, don’t make it. This is your idea, your analysis; you’re not entitled to pass it off as somebody else’s. As this blog has had occasion to say before, claim quotes do not exist for headline writers to signal doubts about their own work, or avoid the consequences of their own words. Claim quotes are for claims: claims made by other people. They’re a peculiarly British convention that other anglophone journalists don’t immediately understand: that’s not entirely surprising, since we don’t always get them right ourselves. This has always seemed a bit odd of the BBC, don’t you think? A while ago, we caught the Daily Mail using claim quotes for an assertion that only the writer of the story had made. This is almost the opposite: the quoting of a fellow journalist at the same news organisation as though he were a third party voicing an unproven opinion. A large part of the problem is that, unlike TV news reports with their time-honoured verbal signoffs (“Joshua Rozenberg, at the high court, for BBC News”), most BBC web stories carry no byline. That means there is no implied authorial expertise in the piece itself, so the writers have little choice but to rely on the broadcast arm’s brand-name correspondents. But quoting a journalist that readers recognise does draw attention to the fact that the author of the article is not that journalist, and leaves a puzzle as to whose voice the article is actually speaking in. In a print environment, the contribution would simply be folded, unattributed, into the body copy and the legal correspondent’s name would be added to the byline. In an anonymous article, that’s not possible. But done like this, the reporter seems reduced to third-party status: just another interviewee like the foreign secretary or the copyright lawyer; just another participant in the debate with a point of view. The BBC, as a high-profile public body with an intrinsically political source of funding, has a long tradition of having to report on itself. Normally, it does this with fearsome impartiality, even in the most existential of crises, such as the row over the Hutton report. When an official inquiry condemned its reporting on the intelligence dossier that played a central role in the Iraq war, the chairman and director-general both departed within a week. But BBC News, responding to the story, reported on BBC News, the instigator of the incendiary report, as though they had never met. Carol Malia, who presents the Look North evening news programme, was involved in a protest at the BBC’s studios in Newcastle. Mike Baker, an education correspondent in London who has worked for the BBC for 24 years, said staff wanted to make a “symbolic” protest. Any newspaper would have closed ranks and decried injustice in banner headlines. The BBC interviewed colleagues on its own solidarity demonstration as though they were striking factory workers in Pennsylvania. The problem is, impartiality as acute as that creates echoes even when you don’t want it to. 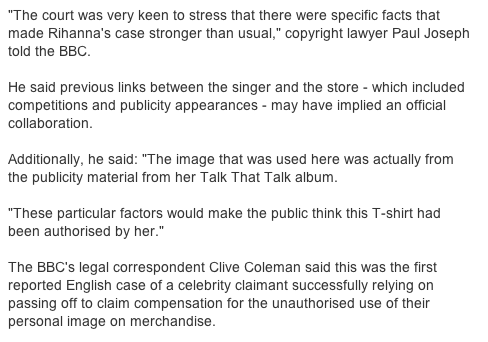 Look at the quote in the story from Clive Coleman, the legal correspondent, in the article about Rihanna. It’s hard to know quite how to take it. It’s a simple statement of fact, but has been attributed to someone other than the author. Does that suggest that it is, in fact, open to doubt? Has it not been checked – or could it not be double-sourced in accordance with the BBC’s rules? (Although if it turns out to be wrong, the corporation could not possibly be hoping to distance itself from someone identified as a BBC correspondent.) Is it true or not? Or is the identification of Mr Coleman as an employee of the organisation meant as an assurance of quality? In which case, it would be much better to have no attribution at all, and write it into the story as fact, along with his supporting evidence for the statement. Fairness and balance is the highest of journalistic goals – indeed, for BBC News, funded by every licence-payer in Britain, it’s the only way it can possibly operate. But, as Jay Rosen has pointed out, there is such a thing as too much innocence in journalism. 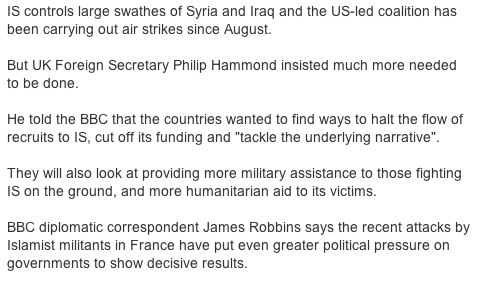 Putting quotes around facts determined by your own specialist correspondents just gives impartiality a bad name.